Having enjoyed a tour of Ha Long Bay -- one of the world’s natural wonders -- why don’t you visit “Ha Long Bay on land”, a tourist attraction in Ninh Bình province not far from the bay? Ninh Bình is located between the Red and Ma rivers. It is bordered by Hòa Bình and Nam Định to the north, Hà Nam to northeast, and Thanh Hóa to the south and west. Ninh Bình is located 91km from Ha Noi and has both rail and road links. Express rail links the province to Ha Noi in the north and Thanh Hoa and Vinh in the south. Buses from Ha Noi's Southern Bus Station stop at Ninh Bình. Bus routes parallel and compliment the rail route. Arriving in Ninh Bình, tourists can’t refuse the chance to visit Tam Cốc--Bich Dong, Cuc Phuong National Park, and ancient inhabited cave of Nho Quan. 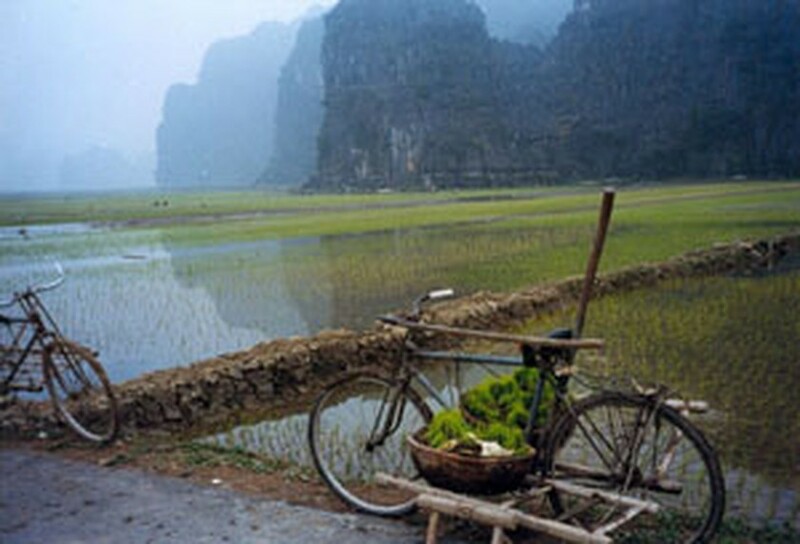 The province also includes Van Long, a protected wetland known as “Ha Long Bay on land”. Tam Cốc (“three caves”) can be visited during a three-hour boat ride along the Ngo Dong river, beginning at the village of Van Lam and proceeding through a scenic landscape dominated by rice fields and karst towers. The route involves floating through three natural caves, Hang Ca, Hang Hai, and Hang Ba. The largest of these is 125m long with a ceiling about 2m above the water. The boats are typically rowed by one or two women who also sell embroidery. Bich Dong is a temple on nearby Ngu Nhac Mountain that was originally built it 1428. It comprises three pagodas: Ha, Trung, and Thuong in ascending order. Tours generally cover historical points and end with a pleasant view from the top. The Van Long wetlands, which is described as a Ha Long Bay on land, has many beautiful caves and grottos. 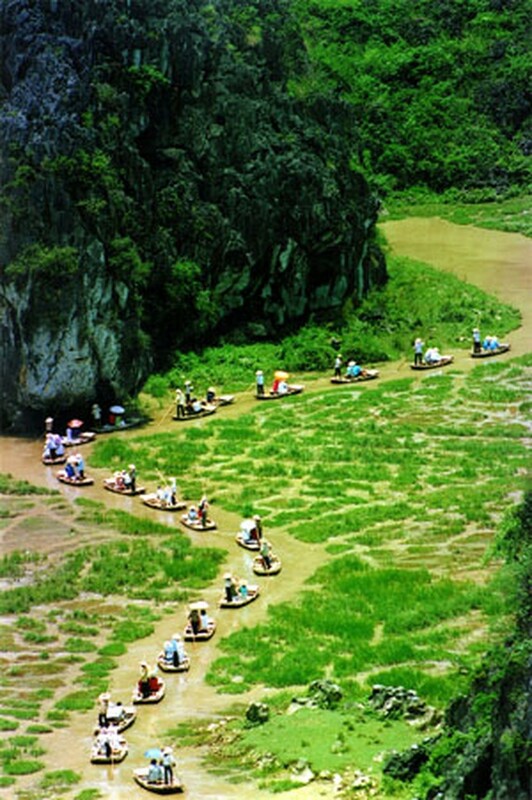 A popular activity among visitors is to ride in a boat ride and view the beauty of the 100m Bong grotto, the four-storey high Duoi cave, or the beautiful Ca grotto, which is half submerged. Ca is 250m long and has magnificent stalactites and stalagmites. The development of tourism around Van Long has changed the area, which now has roads, schools and craft villages. Infrastructure has been improved and many hotels have been built. The area was selected by local authorities for the province’s master plan to promote tourism by 2010. With spectacularly-shaped limestone mountains surrounding the largest wetland in the North, Van Long Nature Reserve attracts many tourists. According to the Ninh Bình Tourism Department, Van Long Nature Reserve had 45,000 visitors, mostly foreigners, in 2007. Once in Ninh Bình, you should visit Cuc Phuong National Park. Human habitation in Cuc Phuong dates back to 7,000-12,000 years ago. Artifacts from that time have been found in numerous caves within the park, including human graves, stone axes, pointed bone spears, oyster shell knives, and tools for grinding. The park consists of verdant karst mountains and lush valleys. Elevation varies from 150m to 656m at the summit of May Bac Mountain, or Silver Cloud Mountain. The limestone mountains house numerous caves, many of which can be explored. Cuc Phuong is home to an amazing diversity of flora and fauna. This includes include 97 species of mammals, including endangered langurs; 300 species of birds; 36 reptilian species; 17 species of amphibians; 11 species of fish; 2,000 species of vascular plants, and thousands of species of insects. Cuc Phuong National Park is one of the most popular nature tourist destinations in Viet Nam. Tens of thousands of Vietnamese and a steady stream of foreign tourists visit the park each year. Other historic sights in Ninh Bình include Bich Dong pagoda and cave, Can Linh Pagoda, Banh Long Pagoda, Dinh and Le Temples, Hoa Lu, an ancient capital, Hoa Lu Citadel and the stone church of Phat Diem.